Dart across Washington Street once or twice, and you probably would not pick Boston as the nation’s safest city for pedestrians. Study after study says it is, though: More people walk to work in Boston than just about anywhere, and the statistics showing that a dozen or so pedestrians are killed in the street every year compare favorably to figures for just about every large city in the country. So by the standards of the nation’s busiest metropolises, Boston is best. But are the city’s streets really safer than those in, say, Concord? The short answer is no. The state’s records on pedestrian accidents in Boston capture only a fraction of such accidents here. That is because the Boston Police Department has refused for years to report most crashes — pedestrians, bikes, cars, and everything else — to the Registry of Motor Vehicles. Officers are needed on their beats, police say, not filling out extra paperwork for the state’s databases. But without a clear picture of crash figures, state Department of Transportation efforts to make roads safer for pedestrians do not reach the state’s largest, busiest city. Just this spring, the city potentially lost a piece of a half-million-dollar state program, and potentially much more in years past, because the city does not fully report its accidents. 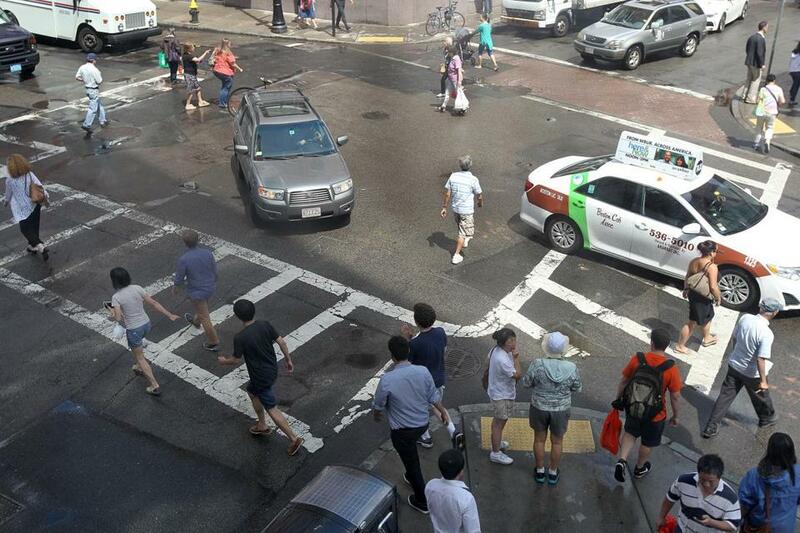 Although the state releases reports on the most dangerous Massachusetts intersections, a city task force, the first in several years to study which areas are the most dangerous for pedestrians, met for the first time just a few weeks ago. Data that would provide a clearer picture of pedestrian safety in Boston do exist. Following a series of requests from the Globe, Boston police and Emergency Medical Services released internal data that showed that the agencies each responded to more than 750 pedestrian accidents in 2013 alone, nearly as many as the state has on record for Boston in the previous three years combined. But the Boston Public Health Commission refused to provide key EMS data, such as the severity and location of each accident. Boston police said their response to a public records request would be given at the end of August. Reporting that data to the state is too time-consuming, a Boston police spokesman said, requiring the completion of a second form for each accident, although a recent digital overhaul in the department could help in the future. Boston police and Emergency Medical Services also say they are working with a recently formed task force to study pedestrian safety, using their internal crash data. The task force, which also includes advocates and city officials, met for the first time about a month ago. The Health Commission cited patient confidentiality laws in redacting the location of the nearly 2,300 accidents to which EMS responded over the last three years; Boston police released a breakdown of 2013-14 accidents in its records sorted by police district. So how safe is Boston? “We can’t make a determination because we don’t have good crash information for the city,” Polin said. Between 2010 and 2012, nearly 5,000 people were injured or killed by cars while walking in Massachusetts, according to MassDOT data. But only 529 of those in the MassDOT data were recorded in Boston, culled from reports filed largely by State Police, who oversee some of the roads and byways in the city, or from individuals involved in crashes. In most communities, police send accident reports to the Registry of Motor Vehicles using CRA-65 forms, which detail every aspect of the crash. In most cities and towns, the CRA-65 doubles as the police report. Not so in Boston, said a police spokesman, Sergeant Mike McCarthy. In the city, that report would have to be completed in addition to the city’s standard police report. McCarthy said the department’s upgrade of a new computerized dispatch system earlier this year may allow for such reporting in the future, automatically translating crash information entered by officers into a CRA-65 form and transmitting it to the state. For now, McCarthy said, crash data can be requested by the city’s transportation and other departments through the Police Department’s research division. McCarthy said the police data showed 790 accidents involving pedestrians in 2013, slightly more than the EMS data show because EMS is not always called to crash scenes. Boston’s transportation commissioner, James Gillooly, said city traffic engineers typically request crash information from police after complaints from neighborhood groups or the public about hazards, or when the city is considering upgrades to a roadway. “When we have a situation where we’re concerned about an intersection . . . we’ll get the accident data,” Gillooly said. Engineers will then review the intersection to see if changes such as signage, road markings, lights, or crosswalks are necessary. When someone dies on Boston’s streets, the bureaucratic gears begin to turn. Police turn over information about the crash to the National Highway Traffic Safety Administration, which tracks all such deaths — motorists, passengers, pedestrians, and bicyclists — through the Fatality Analysis Reporting System. But as Cindy Campbell knows, your life is not the only thing you can lose in a crosswalk. Campbell was a traffic reporter for WCVB 15 years ago, getting ready to go on the air in the morning when she heard a call for a serious accident involving a pedestrian and a truck. The news staff was working to find out whether the pedestrian had been killed. Only later did she learn that the victim was her sister, Lisa, who was struck on her walk to work. Lisa did not die that day, but the brain injury she suffered left her in a coma for months. When she finally woke up, she had to relearn “everything we take for granted,” Campbell said. Lisa is in an assisted-living facility in Malden now, struggling with memory loss. And Campbell, the spokeswoman for the AARP of Massachusetts, has become an advocate for pedestrian safety. Not every pedestrian collision is as devastating as Lisa Campbell’s, but specialists say that studying the data and circumstances around injury and even noninjury accidents is far more useful than studying only fatal crashes. Fatality rates may be what has garnered Boston a reputation as a safe place for pedestrians. The 2014 Dangerous by Design report from Smart Growth America and the Complete Streets Coalition ranked the Boston-Cambridge-Quincy area the safest large metropolitan area in the country for pedestrians, using a formula that weighs fatalities against an estimate of the number of people walking around regularly. In Boston, 13 pedestrians were killed in 2013; four died in the first half of this year, according to police. But the city’s historic street layout makes it difficult to drive fast enough to kill someone in many parts of Boston, and taking stock of all crashes may make more sense than simply counting the dead. “You wouldn’t do a safety program around fatalities,” said Wendy Landman, executive director of WalkBoston, an advocacy organization involved in the city’s new working group. “But you do want to look at accident clusters,” including fatal, injury, and noninjury crashes. The new city task force will eventually undertake that work, said Dr. Huy Nguyen, medical director of the Boston Public Health Commission. By not reporting crashes to the state, the city may have missed out on grants and programs such as an innovative MassDOT effort to improve enforcement, awareness, and infrastructure for pedestrians and bicyclists. Announced in April, the Bicycle and Pedestrian Safety Awareness and Enforcement Program will share about a half-million dollars to help 12 communities around the state pay for stepped-up enforcement and awareness campaigns such as training for the public and police. Landman and WalkBoston have been participating in walking audits in high-crash areas like Fall River and Chelsea. That information, along with feedback from the program’s enforcement component, will help to identify hazards, with the state helping to make infrastructure improvements in the future. “Understanding what’s going on is important before you come up with solutions,” Landman said. In Cambridge, one of the 12 communities included in the state program, crash data has already been used as part of an effort to improve pedestrian safety in one of the state’s busiest pedestrian corridors. The area surrounding the Central Square T station on Massachusetts Avenue ranked fourth among the state’s most active pedestrian accident clusters, according to data from 2002-2011. But although the problem there has been stubborn, it has not been intractable, said Deputy Superintendent Jack Albert of the Cambridge Police Department. Central Square at rush hour is thick with pedestrians, and more pedestrians usually means more accidents. “I call it the hub of the wheel,” Albert said, referring to the spot where traffic from Boston, Somerville, and the Massachusetts Turnpike meet with a busy T stop that attracts and expels thousands of pedestrians daily, in a small city with a robust bicycle culture. On the pin board that Albert used to track accidents when he started out in the traffic enforcement division in 1993, Central Square was always the densest cluster on the map. That has not changed. The accident rates have not dropped, he said, despite the city’s spending on re-engineering in and around the square. Using the cumulative data about crashes, Cambridge gradually reworked the streets around Central Square, adding on-street parking to reduce speed and the number of lanes in either direction. Crosswalks were raised slightly to make pedestrians more visible. Massachusetts Avenue was no longer a drag strip, and injuries that were once debilitating and life-altering became bruises and broken legs. And drivers? Well, they were a little annoyed. “There was a level of frustration and anger and maybe more fender benders,” Albert said.